“I’m an artist, a musician, a magician, a writer, a singer; I’m everything. My name is Lee from the African jungle, originally from W/est Africa. 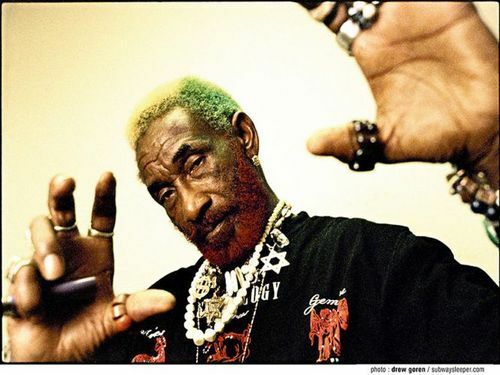 I’m a man from somewhere else, but my origin is from Africa, straight to Jamaica through reincarnation; reborn in Jamaica…” Lee Scratch Perry. Godfather of Dub and Reggae Lee ‘Scratch’ Perry humbled the cosy confines of Eric’s bar last Sunday evening after a fantastic supporting performance from White Bicycles. The now- 76 year old has created a legacy starting in the 70’s from The Black Ark studio where he produced Bob Marley and The Wailers, The Heptones and Max Romeo. Currently there are two feature length movies made about his life and work: Volker Schaner’s ‘Vision Of Paradise’ and ‘The Upsetter’ by filmmakers Ethan Higbee and Adam Bhala Lough. His influence and innovation can be seen across the entire genre of Reggae and the culmination of which showed in his performance last Sunday. Walking through the crowd to find a suitable spot I was greeted with the smiling faces of an audience that varied in age, it seems ‘Scratch’ Perry’s music hits a note with people of all generations. He came on stage clad in a silver studded flat peak that I instantly fell in love with; regardless of the fact I would have found it awful had it of been sitting on anyone else’s head. The backing band kicks in with that classic Reggae beat and the audience all start to move, looking content and carefree. Lee starts to sing in his scratchy vocals that have had him on the end of some criticism recently. Personally I think everyone needs to give the guy a break, if I can sing and dance like that at 76 then I’d like to think I’d feel pretty darn good about myself. If anything his coarse voice only added to the vintage atmosphere, looking round the room from the stage to the audience you could almost feel what his gigs were like in the 70’s when Reggae was new. As his set drew to an all-too-soon close, Perry got the audience so hyped up there were continual shouts for an encore as the crowd repeated ‘LEE. ‘SCRATCH’. PERRY.’ With a heartfelt cheer he graced the stage once more to perform one last song that got everyone back up and moving again as he wished them all well. No one wanted the set to end, the audience lingered after he left once more just in case he made a second reappearance. A little disappointed we all left with huge smiles on our faces and an excellent gig to remember.